Narragansett – The Town council heard an update from Acting Town Manager Dean Hoxsie regarding the town’s ongoing conversation of an extension to the William C. O’Neill bike path, which just last year had a section from Kingstown Road in South Kingstown to Mumford Road in Narragansett completed. Debate and delay of the bike path extension has centered around where in Narragansett the path should run, namely through Canonchet Farm. Michael DeLuca, Director of Community Development, sent a letter dated October 9, 2012 to Director of the Rhode Island Department of Transportation (RIDOT) Michael Lewis, stating the town’s wish to continue discussion to bring the bike path extension, which ideally would run to some point near Narragansett Town Beach, into realization. According to DeLuca’s letter, town officials met with RIDOT on June 5th to discuss a number of town projects which are dependent on RIDOT approval or funding. The construction of a bike path through Canonchet Farm towards the Narragansett Town Beach, which last year was a large topic of debate, is a major component of the Canonchet Master Plan. “In their decision, the Town Council adopted a policy of supporting a route through the Canonchet Farm site ultimately terminating at the gravel parking lot off Ann Hoxsie Lane,” read DeLuca’s letter. DeLuca also made mention in his letter a potential route along the former Seaview Railway, which borders the west side of the Canonchet Farm property and runs alongside Pettaquamscutt Cove towards the Sprague Bridge area. Tanzi and a group of vested local citizens have been working over the past few months to conceptualize the new path option, as well as compromise on specific route details that have been contended with by the town and the public over the past year. 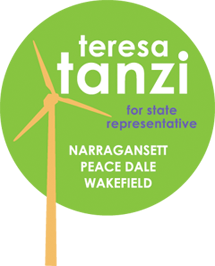 Tanzi noted that she did not have any voting power on the citizen group, but acted as more of a facilitator. The proposal is nearing completion, and Tanzi stressed that the time to decide on a plan for a new bike path extension in Narragansett is closing, noting that the $1.2 million originally earmarked by RIDOT in the early 2000s for the bike path could be lost if no decision is made soon. The town will now wait for its response from RIDOT and have an agenda item placed on the November 5th regular meeting for further discussion regarding the bike path extension.